Shenkuu is nestled above the mountains of Altador. This beautiful merchant town has because a favorite for many Neopians. Shenkuu is known for its ornate and oriental style - one that is arguably the most unique throughout Neopia. Shenkuu is at such a high altitude that the mountainous peaks are above the clouds. You have wonderful views throughout the day and night, and there is even a beautiful waterfall that runs through central Shenkuu! The only way to travel throughout the peaks is by suspension bridges, so if you are afraid of heights, maybe you should just showcase Shenkuu in your Neohome instead! Showcase this beautiful fan in your home in a shadow box. Shadow boxes are small and typically filled with items that stick to a specific theme. The fan would, of course, be the focal point of the box by placing it in the middle. You can surround your beautiful fan with several smaller prized Shenkuu-esque items. Your shadow box would look great placed over a fireplace! If you are trying to show off Shenkuu in your home, you may as well have ink imported from Shenkuu. The ink’s bottle is unique and showcases the ornate, oriental style of Shenkuu and it sports an emerald green bottle with gold accents. This ink is perfect to write letters, postcards or notes with. The ink is quick drying, so you don’t need to worry about it smearing on your papyrus. Sushi lovers rejoice! This magnet is small and adorable, and is perfect for your Shenkuu Neohome. This magnet would look perfect on your refrigerator or an erasable calendar. The perfect souvenir, any onlooker would immediately recognize the Shenkuu environment in which this magnet encapsulates. Be the envy of your friends, and buy this magnet today! Shenkuu is known for its exotic foods, and now, you can have a book for them in your Neohome! This book provides you with an extensive list of all the exotic foods you can think of! It even has some recipes for you to try out. This book is the perfect addition to any home that is trying to make it feel like they’re in the center of Shenkuu! We suggest having a copy to take on shopping trips just so you can easily identify ingredients and making yourself more aware of the hundreds available! Not only does the inside of your home need to be Shenkuu themed, but you can also make your garden fit the theme as well! This flag will show your friends and neighbors that you have style! You can add bushes, flowers and trees to help accentuate this lovely flag! Your garden will be the best on the street! Everyone will envy you! The perfect item for all collectors of Shenkuu, the Shenkuu Collectors Usuki is a must have! Showcasing Shenkuu’s fashion, this Usuki highlights the colour palette of the merchant town. Carry it with you always in a handbag, or display the Usuki in an encased cabinet - either way, this Usuki is charming and the perfect ornament to remember Shenkuu. No matter where you go in Shenkuu whether it is to a restaurant or library, everyone sits on a cushion. So we thought, why not have your own in your home? This stylish and super comfortable cushion has a traditional pattern on it, so it doesn’t clash with any other items you have. Even if you wanted to have multiple in your home, you can! These cushions thankfully don’t break the bank! Ah, the beautiful landscape of Shenkuu in an interactive ornament! Buy this snowglobe, and see snow in Shenkuu always, not just on rare occasions! This special item is perfect for fanatics, and those who wish to always picture the majestic town. Display it proudly so all guests can get a vision of the special community of Shenkuu. Snow globes are always a fan favorite! An exquisite addition to any home, this window will liven up any room in a way only Shenkuu can do. The oriental style is a focal point, and will surely make your Neohome the talk of the town. Make every room a center of attention with this special window, or showcase a Shenkuu style in one area of the house - either way, this Shenkuu Style Window is bound to be the perfect purchase for any Shenkuu aficionado. This Shenkuu Bulletin is the perfect item to keep you informed on all daily Shenkuu happenings, no matter how far away you may be. Add your own events for a more personal flair, or just seek out this item in order to feel at home away from Shenkuu. It’s the perfect newsletter or calendar for all lovers of Shenkuu! When designing your Neohome there are plenty of ways you can decorate it. You can go bold, classic, minimal, etc. If you want to show tribute to your favorite Neopian world, we approve of that as well! Choosing Shenkuu to showcase in your Neohome will be bold and ornate. With these ten items, showcasing Shenkuu in your Neohome is made a reality. The colour schemes of red, yellow, and brown help with maximizing your comfort and home’s potential. 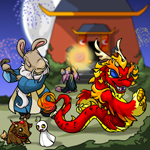 Thank Fyora for Shenkuu; the oriental style is one of a kind, and every Neohome is unique and exquisite. Do you plan on decorating your home with a Shenkuu style? If you plan on using our guide, let us know how it turns out! Thanks for reading! We can’t wait to share our next installment! We are really sorry for the mess this boy did in our last comic!